Peter Parker: We all have secrets: the ones we keep... and the ones that are kept from us. The Amazing Spider-Man sits in a very difficult place. Despite the fact that Spider-Man is one of the most universally loved superheroes, the idea of a new movie that recaps his origins seems to be perplexing to many people. 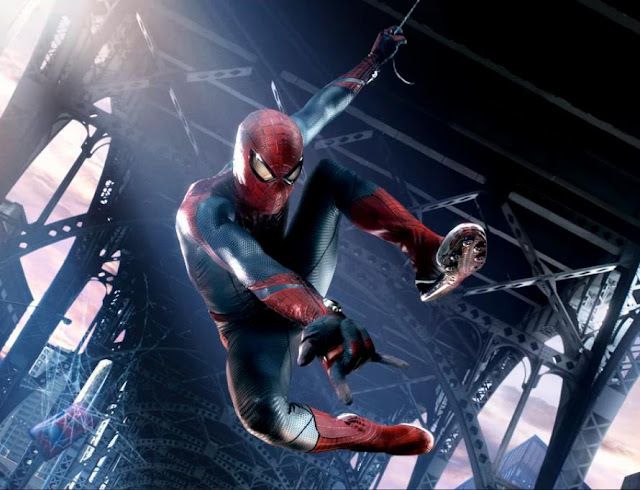 It has only been 10 years since the first Spider-Man, and within that time frame, two widely praised films came from that franchise, along with a host of other superhero films. It is one thing to restart a fairly recently created franchise and it is a whole new challenge to have yourself standout amongst a slew of other, similar features. I can’t say that The Amazing Spider-Man succeeded at being the best Spider-Man film or among the best superhero films ever produced, but I can say that everyone’s friendly, neighborhood web-head is back in a very entertaining feature film. The story may sound familiar. 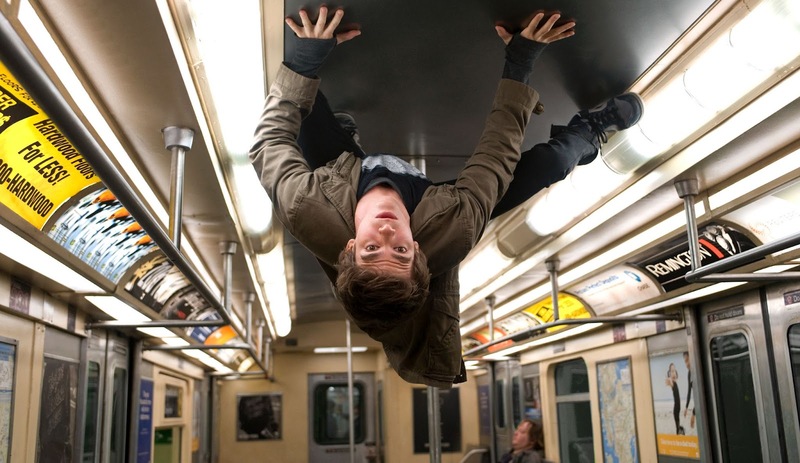 Peter Parker (Andrew Garfield) is a high school kid and social outcast. He lives in Queens, with his Aunt May (Sally Field) and Uncle Ben (Martin Sheen). 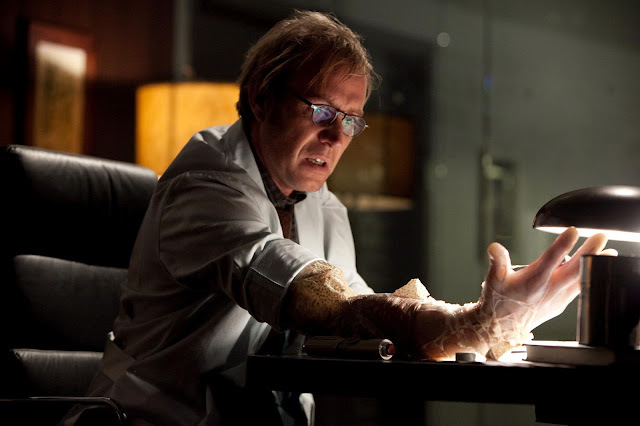 One day he discovers an old briefcase of his fathers, which has a number of files that link him to some sort of special project at Oscorp Industries with Dr. Curt Connors (Rhys Ifans). Peter’s parents left him a long time ago, under mysterious pretenses, and the chance to find out more has Peter intrigued enough to go to Oscorp and attempt to learn about what happened to them. A few things happen to Peter, once arriving at Oscorp,; he makes a good impression on Dr. Connors, he learns that his crush, Gwen Stacy (Emma Stone) works for Oscorp as well, and he gets bit by a genetically altered spider (I know, another average Monday). The spider bite does what we all know; it turns Peter into a new man, giving him new gifts such as enhanced strength, the ability to stick to walls, and “spider-sense”. With his newfound powers, come great responsibilities of course, but Peter, at first, lets some of these skills go to his head, which leads to an argument with his Aunt and Uncle. This only leads to a tragedy, which has Peter trying to right his wrongs by going after criminals. At first, it is one specific criminal, but his vigilante efforts evolve into something more. At the same time, Peter’s part-time work with Dr. Connors has led to another transformation, which could be disastrous for the city of New York. It will be up to the newly dubbed “Spider-Man” to do what he can to keep everyone safe. It is hard to not judge this film against its predecessors, but at the same time, this is a movie that really must be judged that way. Sam Raimi’s Spider-Man from 2002 was a solid film. It is not a favorite for me in the realm of Spider-Man or superhero films, but it was something very new at the time, in terms of presenting a fun and colorful Marvel superhero film that used the template of Superman: The Movie to its advantage. 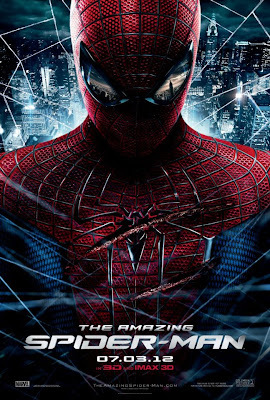 Marc Webb’s The Amazing Spider-Man is more of a mix between what Raimi was able to give audiences with his first Spider-Man film and what Christopher Nolan did with Batman Begins, in terms of story structure and tone. The film does a lot of recreating of what we saw in the first Spider-Man film, but with an alternate sort of take on a lot of those aspects, a key one being the angst-ridden nature of Peter Parker, which comes with the territory of being a geeky social outcast in high school. Once the film retraces Parker’s steps into becoming the web-head, the film’s second half gets into the more standard superhero film territory, which leads to a hectic third act, with plenty going on. There are several components that make the film a success overall. Chief among them is Andrew Garfield. His performance as both Peter Parker and Spider-Man is an effective piece of work that lends the right kind of strengths needed for both of these personas. Parker is smart, likable, and a good guy overall, but has some anger in him as well, regarding a past shrouded in secrecy and other factors, based on where the story goes. Spider-Man is a wiseacre. He is a hero for sure, but he lets a sense of mischief have him enjoy the thrill of being a super-powered individual. The Spider-Man side was always hit or miss for me in regards to Tobey Maguire’s work (though I did enjoy him a lot as Peter Parker), but Garfield seems to be having more fun in the costume. Peter Parker: Ahem, you know, if you're going to steal cars, don't dress like a car thief. Car Thief: You a cop? Peter Parker: You seriously think I'm a cop in a skintight red and blue suit? In regards to the rest of the cast, Emma Stone is one of the other very good things about this film. She and Garfield have wonderful chemistry together, but Stone manages to be such a warm screen presence, that it would be easy enough to just watch extended sequences involving her hanging out at school or Oscorp. Still, it is nice to see Gwen Stacy and Peter Parker together. The other Spider-Man films focused more on putting the romantic plot at the core of the story, but ‘Amazing Spider-Man’ settles for making it one of the many subplots. It is fortunate that the relationship is handled well enough as more of a by-product of great chemistry, so it does not feel shoehorned in nor forgotten about, which is probably a big reason why Webb was chosen to direct, given his work on (500) Days of Summer. Rounding out the cast, it feels obvious that strong actors like Sally Field and Martin Sheen are good in their roles and do exactly what is required, so I do not have much to say about them. Dennis Leary’s work as Gwen’s father and the Police Captain, George Stacy, is effective enough. It is an area of the film that I believe is allowed to be played a bit more heightened, as he plays a man with attitude and a foil to Spider-Man’s cause, but you understand where he’s coming from and Leary’s handling of the character is fitting. Lastly, Rhys Ifans ends up being just okay in his role as the villain. This is not so much his fault, as the film can only find so much for him to do, before settling into having “take over the world” syndrome, but it is a shame that the tragedy of Dr. Connors did not feel more significant. Ifans does get to have some very good scenes with Garfield early on, but once he goes mad and turns green, the character does not manage to feel as effective as Willem Dafoe (despite the bad Green Goblin costume) or Alfred Molina as Doctor Octopus. I will give kudos to Sony and Marvel for at least going through Spider-Man’s rogue’s gallery, as opposed to Superman films, which have used Lex Luthor for how many times now? From a technical standpoint, I found the film to be very well done. 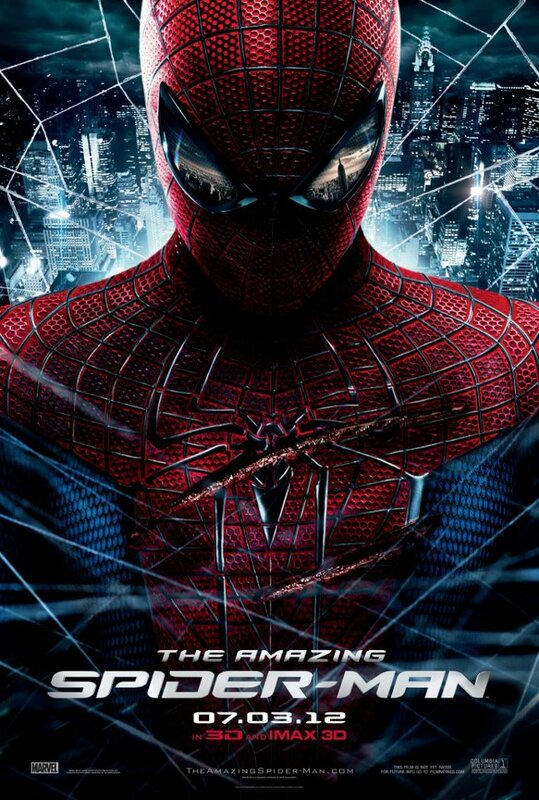 Perfectly fitting of the film’s title, Spider-Man does indeed look amazing, as he swings through the air and spins webs (any size) in glorious 3D (Obligatory 3D rating: acceptable), with an appropriate James Horner score reflecting the heroic nature of this arachnid boy’s actions. While the other Spider-Man films did get much better in the effects department, with Spider-Man 2 still having one of the best action sequences in the realm of superhero films, the first film always bugged me with its weightless wall-crawler bounding across buildings and swinging clunkily through the air. It does not look terrible, but it also felt strange at the time, not just because it is now ten years later. The Amazing Spider-Man has no issue in this regard. Sure the Lizard looks cartoony, but that is pretty much expected. Spider-Man’s movements through the city are well done, the use of practical effects pays off in their various instances, and the film features a number of special effects-driven action sequences that work quite well. My gripes with the film more or less mainly revolve around what was supposedly promised in the story versus what was delivered. Given that much of the marketing for the film centered on the key words, “The untold story,” it would makes sense for this film to deliver on that aspect, but it oddly doesn’t. We are given glimpses of what went on with Peter Parker’s parents and are even thrown into the plot, based on Peter’s discoveries, but once Peter becomes Spider-Man and Dr. Connors goes into Lizard mode, the initial motivation for the plot goes missing. Instead, we are given a story that plays more like a framework of a majority of other superhero origin films (and at 138 minutes, it is certainly padded out enough). I did enjoy the alternate take on Peter Parker being bitten, based on a more take charge attitude towards getting answers by having him infiltrate Oscorp, but I do wish the film was more ambitious in making these sorts of changes to his backstory. That is essentially the other big issue. The Amazing Spider-Man was an enjoyable experience for me, but it is not one that stands high above anything else I have seen before. I tend to be pretty lenient on superhero films, because the idea that studios are making live action iterations of beloved superhero characters in general still manages to give me a certain type of thrill, but at the same time, it is now a crowded genre. While a majority of superhero sequels tend to work on a different level, due to the ability to now explore what was setup in the first film, these origin stories really come down to needing something very specific to keep from feeling ordinary. The Amazing Spider-Man has a checklist of things that feel required for these movies at this point: a strong cast of actors, well-done effects, perfunctory plotting that is less effective in the second half, and an over-the-top villain with a grand plan that does not really mean much to me. Something like Iron Man has a commanding and charismatic performance by Robert Downey Jr. that separates it from others. Captain America has pulpy charm and a great cast. Thor has a nice smile. Amazing Spider-Man plays well with its emotions and human relationships, but is in an area where the spectacular is achievable, but not something unseen in many similar films. To be more direct, I was fine with having a new take on Spider-Man. It may not have been necessary to retell the origin story, but for what was delivered, I think there is a good film here. The performances are solid and the film looks great. It treads fairly close to the initial outing of Spidey, but it also features a lot of altered concepts and comic ideas (hurray for mechanical webshooters!) that I was happy to see take place. I do wish more was done to differ from many other superhero origin stories, particularly regarding a villain that initially had good intentions/is a father figure for the hero, only to be driven mad, but I do not think it necessarily handles these aspects poorly. The film takes place on a grand scale, which I appreciated; has room for quieter moments, which is nice, and delivers on many other aspects that revolve around the comic goodness of a Spider-Man picture. Stepping onto a crowded field, The Amazing Spider-Man has its hang-ups, but it still swings at audiences with plenty of entertainment value to share. Gwen Stacy: My Dad has five hundred officers looking for you. Peter Parker: Five hundred? That seems a bit excessive. Hey man, thanks! I'll try to read yours, if you put one up.